Most trade show exhibitors understand the availability of the trade show exhibits you own and the ones that you rent. But then what are the pros of renting the trade show exhibits of a company. To start with, let us say that all of this depends on the company’s requirements. The company might exhibit at only one or two shows per year. They might even need to exhibit at more than two shows a year. Or there might even be a requirement to exhibit at multiple shows a year, with some shows happening at the same time at multiple locations. Next do you need or want flexibility in the size, look and feel of the exhibit from one show to another? Answers to these questions help you quickly determine, whether or not renting is the best option for a trade show program. Capital Expenses and the tax man: As rental exhibits need not to be bought it helps in minimizing processing and administration of large capital expenses. No shipping or storage fees: Owning a trade show exhibit brings in the hassles of shipping and storage too. If your trade shows are just rentals, you will neither have to store it nor will you have to ship it after use. This saves money, hassle and time. Minimum maintenance and repair costs: Just because you do not own the rental exhibits, the cost of the routine maintenance as well as repairs from the wear and tear are minimal to non-existent. During set-up, tear down as well as shipping, trade show booths can sustain extensive damage. In case of rentals this is definitely not your responsibility. Custom Exhibits at a lower price – With Rental trade show exhibits one need not purchase the entire structure of the booth. The money thus saved can be used to customize the exhibits with brand graphics or a larger footprint and floor space. A different look from show to show – In a world where first impressions are everything, updating the look of the show from time to time can prove to be really important. Rentals give one the flexibility of evolving the entire exhibit design and structure from show to show. This includes the size and footprint. Costs can be higher over time – Especially if the company is exhibiting at several shows per year, renting the trade show booth can cost a company more money than purchasing over the years. Rentals can show wear – Depending on the place from where one rents their trade show exhibit, rentals may show visible wear and tear after frequent usage, shipping and set up. It is important to shop wisely. Availability – In case you do not own these displays, there costs can prove to be quite high. Further, availability, especially at the last minute, can also be a concern. Furniture and accessory cost – Costs for the components of the trade show can yet again be a concern, in case you do not own the furniture. Renting is a great option if you value flexibility and if you are working under a tight budget. 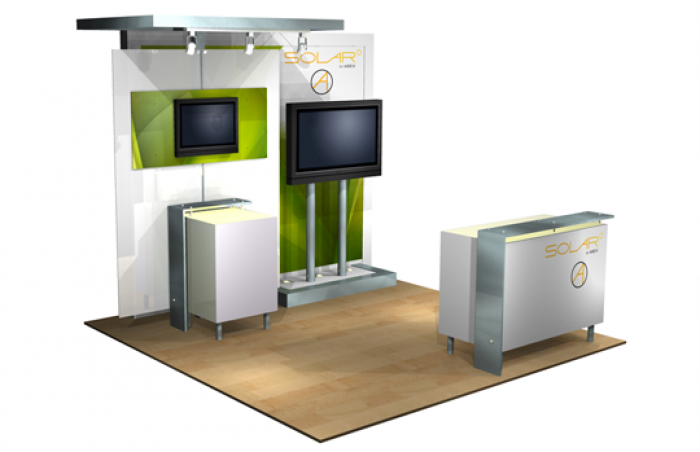 Compare the pros and cons before deciding on your trade show displays.